With just over five weeks to go until the start of the Circuit of Ireland Rally, two of Ireland’s top drivers took a break in their training to help officially launch this year’s event in Lisburn. 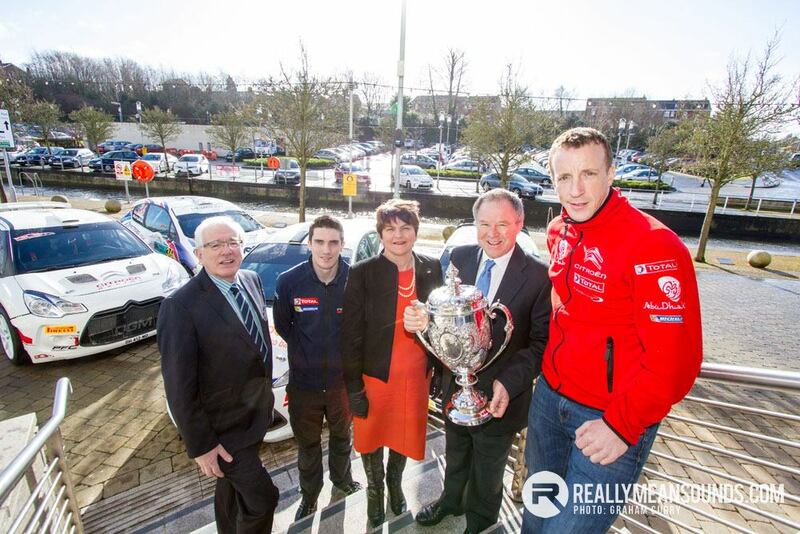 Craig Breen, who currently sits second in the European Rally Championship following his recent win in Latvia, and WRC Citroen Racing Team driver, Dungannon’s Kris Meeke, joined Enterprise Minister Arlene Foster and Circuit of Ireland Rally Event Director Bobby Willis to give fans a taste of what’s in store this year. The 2015 event, which will be held from Thursday April 2 to Saturday April 4, is one of 10 rallies in the prestigious FIA European Rally Championship calendar and will be the only round of the ERC in the UK and Ireland. Last year over 74,000 people came to view the stunning stages across counties Antrim and Down and the event, broadcast by Eurosport, was seen by over 14 million across the world. Speaking at Lagan Valley Island in Lisburn, where the thrilling ‘Power Stage’ of the rally will be held on Saturday 4 April, Mr Willis said: “I’m so proud and excited that we are launching this historic event for 2015 with the support of the Enterprise Minister, her department and so many of our local councils. “Breen is certainly one to watch for the Circuit, after his win in Latvia, but there will be serious competition for him. The cream of the European Championship’s drivers are coming and it’s likely to be a fantastic fight to be first to the podium on Easter Saturday afternoon. Minister Arlene Foster, whose department supports the event, said: “Following on from the great success of last year’s event, the 2015 Circuit of Ireland Rally once more promises to deliver the very best in motorsport as Europe’s finest drivers compete on the most challenging roads in Northern Ireland. Waterford driver Craig Breen said: “Last year’s Circuit of Ireland was an amazing event with so many highlights, including the welcome we received from fans at Belfast City Hall and at each individual stage. “Although it wasn’t the most successful rally for me as my car suffered problems and I had to retire, we’ve sorted out the problems and my car ran faultlessly in both Austria and Latvia, so I’m feeling positive and excited about competing in the home round of the ERC. The Circuit received another boost last week when it emerged that world famous actor Idris Elba, who played Nelson Mandela in the film Mandela – Long Walk to Freedom, is to compete in this year’s event as part of a new Discovery TV series where he pushes himself to the limit on a range of sporting challenges. Entries for the 2015 Circuit of Ireland close on Tuesday 17 March. Organisers are in the process of finalising arrangements for what promises to be a bumper few days of motorsport and the management team is calling for additional volunteers to join the existing team of marshals. For more details and to register log onto www.circuitofireland.net or call the volunteer hotline (NI) 07956 612235 or RoI 00353 (0) 8572 39426.